Global logistics giant Deutsche Post DHL Group is optimistic of Sri Lanka’s future and has committed to expanding in tandem with growth for which it believes better infrastructure, education and greater openness are crucial. “Sri Lanka is at the tipping point for South Asia, like what Singapore is for ASEAN. 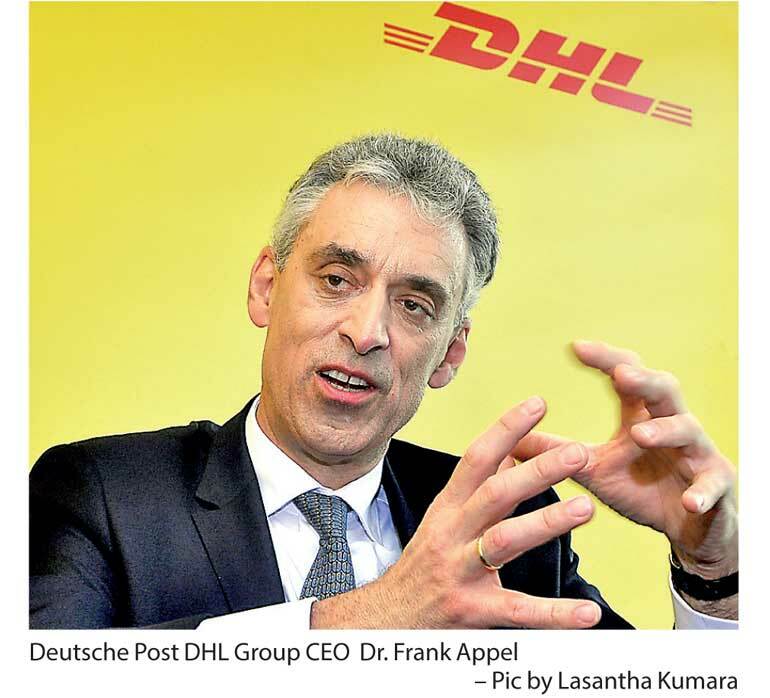 I am optimistic Sri Lanka can deliver on this potential,” Deutsche Post DHL Group CEO Frank Appel told the Daily FT in an exclusive interview during a two-day visit to Sri Lanka last week. It was the first time a CEO of the logistics giant has ever visited Sri Lanka and it reinforces the commitment and importance DHL attaches to the growth of operations here. Deutsche Post DHL Group’s business comprises DHL Express and DHL Global Forwarding. DHL Express has 19 express centres feeding two facilities in Colombo and Katunayake with a staff of 230. DHL Global Forwarding, which has two gateways and 11 warehouse facilities, handles around 10,000 air freight shipments and 7,000 ocean freight shipments in Sri Lanka annually. It has 100 full-time staff and 300 support staff. Globally Deutsche Post DHL Group is present in over 220 countries and generates over Euro 57 billion in revenue. The CEO since 2008, Appel said he was very happy with the progress of the group operations and success in Sri Lanka as well as the growth prospects of the country’s economy. In March a DHL Life Sciences facility was opened in Colombo to provide a temperature-controlled warehouse to improve availability of and minimise damage to drug supplies in Sri Lanka’s hospitals and clinics. According to DHL Sri Lanka, medical and pharmaceutical imports have skyrocketed in recent years to hit $ 460 million in 2015, yet hospitals and clinics still face persistent quality-control issues associated with unregulated temperature, inconsistent inventory and delayed distribution of medications, all of which put patients’ lives at risk. Through the new facility DHL is providing the life sciences and healthcare sector with top-tier infrastructure which they need to service the growing domestic demand for pharmaceutical goods as well as establish itself as a leader in drug safety and availability on the world stage. “With Sri Lanka’s middle class growing we anticipate higher demand in life sciences and healthcare sector for quality and reliability,” emphasised Appel. DHL has for the past decade has been an integral part of the global success of Sri Lanka’s apparel/fashion industry, offering world-class quality, reliability and speed. Appel, who met local staff and customers during his visit, said Sri Lanka was ideally positioned geographically to be the gateway to India and South Asia apart from connecting Europe and Africa faster. “With peace, Sri Lanka’s prospects have improved considerably. If the country can open up more, further improve ease of business and compliances, infrastructure and education and skill sets, greater foreign direct investments are certain,” the Deutsche Post DHL Group CEO pointed out. “Sri Lanka is an important and growing economy in the region. Given the expanding middle class I see plenty of opportunities for growth in Sri Lanka,” added Apple, who was with DHL Global Forwarding Country Head Najeeb-Ur-Rahman and DHL Express Country Head Dimithri Perera during the interview. “In tandem with the growth of the economy, DHL too will expand, creating more jobs and providing superior solutions to the drivers of the economy,” Appel added. He said bolder policies and greater integration with the rest of the region, either with multilateral or bilateral agreements, will further strengthen Sri Lanka’s competitiveness and prospects. In this context, Appel, who is a firm believer in free trade, welcomed the Government’s efforts to forge a more comprehensive economic partnership with India and Free Trade Agreements with China among others. “Protectionism isn’t a good thing for the country. There may be short-term gains but the consequence is long-term loss. By opening up for FDIs and multinational corporations, countries and their private sectors become more competitive,” the Deutsche Post DHL Group CEO emphasised. Deutsche Post DHL Group offers logistics services ranging from national and international parcel delivery, e-commerce shipping and fulfillment solutions, international express, road, air and ocean transport to industrial supply chain management.